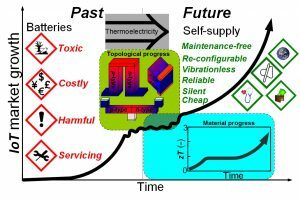 M. Haras and T. Skotnicki, ‘Thermoelectricity for IoT – A review’, Nano Energy, vol. 54, pp. 461–476, Dec. 2018, doi: 10.1016/j.nanoen.2018.10.013. Urged by the worldwide increasing demand in energy, constrained by the limited reserves of fossil fuels and facing a problem of global climate change, all innovative solutions contributing to improve the renewable production of energy are playing a strategic role. Meanwhile we are witnessing an unprecedented expansion of Internet of Things (IoT) market. Despite the huge popularity of IoT, its further expansion is slowed down by a lack of viable power supply methods capable to replace wires or batteries.